This week’s HART Weekly Review includes Questions asked by Baroness Cox in the House of Lords, Blogs, and a summary of the top stories from the countries where we work. 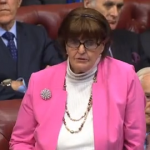 Baroness Cox Debate on Syria: House of Lords Hansard – On 20th December 2017, Baroness Cox and other Peers asked the UK Government about their role in the current situation in Syria, and what they intend to do to rebuild the country after years of ongoing and devastating war. Baroness Caroline Cox speaking in parliament. Have you got a question for the Government? Suggest a question for a written answer. Female Genital Mutilation on the Rise: Female genital mutilation (FGM, also referred to as cutting) is a human rights violation of the most devastating kind. The procedure involves the removal of some (or all) of the female genitalia. It is illegal in many countries, including the UK, but legal structures have typically fallen short of their purpose. News Round Up – the top stories from this week’s news in our partners’ countries. Myanmar bars U.N. rights investigator before visit: The U.N. independent investigator into human rights in Myanmar called on Wednesday for stronger international pressure to be exerted on Myanmar’s military commanders after being barred from visiting the country for the rest of her tenure. Rights group reports more destruction of Rohingya villages: Satellite imagery shows that Rohingya villages in Myanmar continued to be destroyed even as Myanmar and Bangladesh signed an agreement last month to return refugees. This combination of satellite images provided by the Human Rights Watch/Digital Globe show four villages in Maungdaw township, northern Rakhine state, Myanmar. SERAP to Buhari: Explain to Nigerians decision to withdraw $1bn to fight Boko Haram: SERAP urged President Muhammadu Buhari to “urgently explain to Nigerians why the government decided to withdraw the sum of $1 billion from the Excess Crude Account to fight Boko Haram insurgency in the North East Nigeria. Boko Haram militants attack food aid convoy in Nigeria: Boko Haram militants have killed four people in an attack on a food convoy carrying aid to displaced civilians in Nigeria. Some 8.5 million people in the conflict region are in need of humanitarian aid. South Sudan rebels accuse army of attack as peace talks restart: South Sudanese rebels accused the government army of attacking one of their bases overnight as a new round of peace talks between the warring sides opened in the Ethiopian capital on Monday. Humanitarian Coordinator welcomes news of six aid workers safely accounted for in South Sudan: (Juba, 20 December 2017): The Humanitarian Coordinator for South Sudan, Alain Noudéhou has today welcomed news of the safe return of the six aid workers who went missing four days ago in South Sudan’s Western Bahr el Ghazal region. Security official, Sudan ready to protect Jerusalem: “All young men and women in Sudan are ready to defend the Palestinian cause” the Sudanese president spoke to a rally in the town of Al-Golid. In Uganda, could entrepreneurship be the key to tackling youth unemployment? : There are a host of barriers to employment, but part of the problem is a general lack of jobs. And so the country, and a growing number of nongovernmental organizations, are looking to entrepreneurship to help solve the problem. Uganda MPs vote to scrap presidential age limit: Uganda’s parliament has approved a constitutional change that will allow the current president to run for an unprecedented sixth term in office.